The “great omniscient” Lonchen Rabjam (1308-1364) gathered the lineages and instructions of Mahasandi. 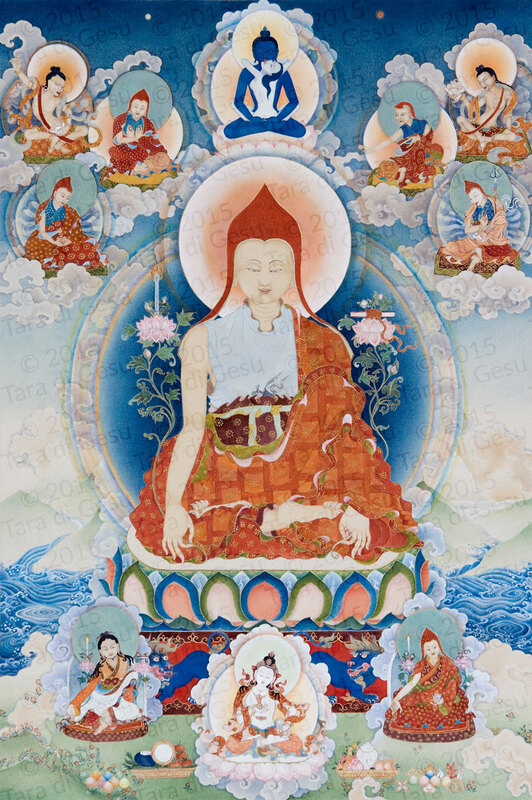 He left a vast written legacy with many extensive commentaries and teachings, all of which are preserved within the Tibetan Nyingma tradition. Also pictured are from the upper left: Shri Simha, Garab Dorje and Vimalamitra. On the upper right Jnanasutra, slightly below Manjusrimitra and Guru Rinpoche. Below Longchenpa, Jigme Lingpa, Vajrasattva and Jamyang Khyentse Wangpo.